Allowing the operators to select user-defined load configurations, IntelliGen palletizing Software is capable of adjusting load configurations, patterns and product sizes without leverage complex external software programs. Featured with additional functionality such as row-forming and case-turning, Intelligen software enables multiple-piece picks and drops on multiple rows and also offers compatibility with major robotic arm brands. Intelligrated® (www.intelligrated.com) a leading North American-based automated material handling solutions provider, announces its IntelliGenT palletizing software that allows operations to easily adjust pallet load configuration without the need for extra programming or cumbersome integration. Designed for robotic palletizing operations that handle a variety of product types and sizes, the new software allows operators to simply adjust load patterns and stacking characteristics based on changing product dimensions and other variables, offering improved flexibility, speed and load integrity. The IntelliGen software comes integrated with the robotic cell's standard control system and allows facility operations personnel to select user-defined load configurations, greatly simplifying product changeovers. The software also provides the capability to adjust load configurations, patterns and product sizes without the need to make a service call or leverage complex external software programs. Facility staff can use IntelliGen to make these changes with minimal training, extending the palletizing cell's capability beyond the initial product mix. The software's advanced functionality also includes row-forming and case-turning, enabling multiple-piece picks and drops on multiple rows, yielding higher rates than competitive alternatives. "As SKU proliferation and packaging evolution continue, managing the product variability in palletizing operations demands simplicity," said Matt Wicks, vice president, product development, manufacturing systems. 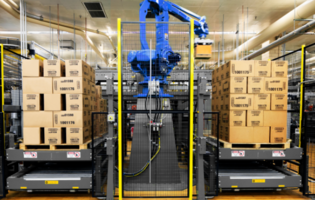 "IntelliGen simplifies the process of updating the robotic palletizing cell with the necessary flexibility to support a wider range of products while maintaining load quality at high rates." The IntelliGen platform offers wide-ranging compatibility with major robotic arm brands and supports a variety of customized end-of-arm tooling. This reduces integration time and provides the ability to handle a variety of packaging types, including corrugate cases, plastic totes and bags, making the software well-suited for diverse applications across multiple industries ranging from food and beverage to warehousing and distribution. To learn more about IntelliGen, visit Intelligrated at PACK EXPO International booth S-3666. About Intelligrated Intelligrated, now part of Honeywell, is a leading North American-based, single-source provider of intelligent automated material handling solutions that drive fulfillment productivity for retailers, manufacturers and logistics providers around the world. Through a broad portfolio of automation equipment, software, service and support, Intelligrated solutions give businesses a competitive edge and optimize operational performance through increased flexibility, efficiency and accuracy.